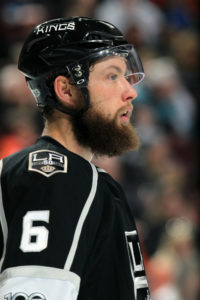 The good: For reasons that are difficult to explain, Jake Muzzin was unable to take advantage of his own burgeoning credentials and growing recognition across the highest levels of the sport, turning in a lopsided 82-game season that across the board fell short of his impressive campaign one year prior. Last summer, Muzzin was a “reliable top-pairing defender,” a “good defender and … a shutdown guy” when the team was clicking, and as anyone who has followed his secondary statistics would be quick to argue (guilty! ), “one of the league’s renowned play-drivers.” That review comes in stark contrast to April, 2017, when the Kings neared the end of the slow drain of the 2016-17 season, and there were those within the organization who had grown frustrated with the 28-year-old’s inconsistent play. The Kings have a pretty good mix of effective, mobile defensemen up and down their blue line, but as it stands they do not have a number two unless Jake Muzzin is a number two. This past year, he was not a number two. Hey, wait! This is the “The good” section. Despite a season that he won’t be overly fond of, there were some bright spots. Muzzin played all 82 games for the second straight year and has now played in 238 consecutive games, only six back of Drew Doughty for the active team lead. He also faced opponents with the highest CF/60 out of any season in his career, and his 31.5% defensive zone start rate was the highest out of any team defenseman. It’s clear that even when the Muzzin-Martinez pairing had been struggling during the season, it wasn’t for a lack of tough competition they were facing. He was also quite good in shorthanded play as the team channeled 15.4% of all shot attempts towards the attacking net in four-on-five play – the best rate among team defensemen who killed penalties – and surrendered 3.69 GA/60 when Muzzin was on the ice in four-on-five play, the second best GA60 rate among team defensemen. Really, his struggles came at even strength, and his 953 PDO (What is PDO?) was a testament to a season that wasn’t all puppies and ice cream, though he did (again) post possession rates in the black compared to most of his teammates on the league’s top ice-tilting team. 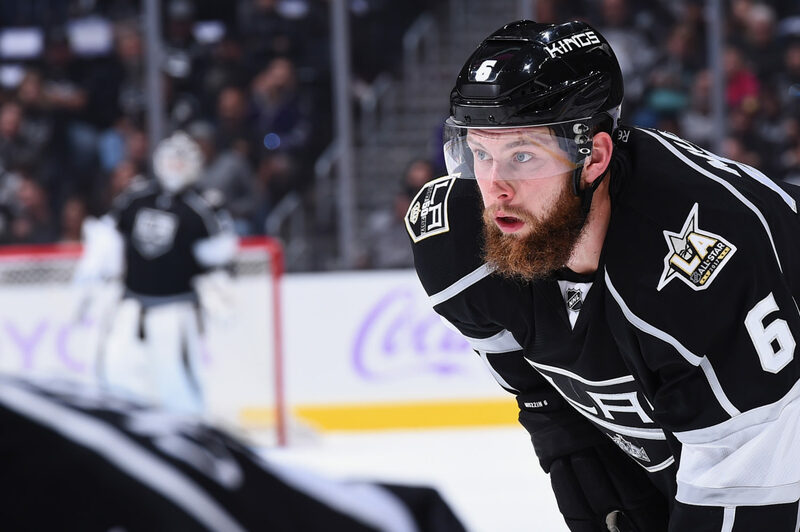 Muzzin was among the players who, with the evolved personnel from three years ago, was asked to continue to grow his own game and take over a larger share of the team’s leadership handles. He’s funny, he’s easy to talk to, he’s popular within the room and doesn’t shy away from the game’s edgier moments. But there are still major questions over where exactly his trajectory is at following a year in which he just couldn’t put all of his diverse gifts together on a regular basis. The bad: The Kings had referenced changing up some of their penalty killing and defensive zone systems play at different points of the season; whether or not that had an impact on Muzzin’s performance, he was getting scored on at too high a rate. His GA/60 in five-on-five play was 2.75, the highest among club defensemen and the second highest on the team overall. His numbers dropped in assists (from 32 to 19), points (from 40 to 28), shots on goal (from 203 to 184) and five-on-five Corsi-for (from 57.5% to 55.6%). “I’ve kind of been struggling with the consistency of the game, whether that be period-to-period or game-to-game,” he said in February. “I’ve just got to work on getting back to the basics and what makes me a good player and get my foundation back and go from there.” That, according to the coaching staff, has to be in the physical aspects of the game. “That doesn’t mean tramping or running over guys, but you have to be able to absorb it, to make plays, and then when it’s there, also initiate it, and that’s something that he’s really working on to try and get back in his game, and he will,” said Darryl Sutter, who noted he had confidence Muzzin would be able to do so over the final seven weeks of the season. It’s speculative, but in conversations, there has been the thought that the World Cup affected something that displaced his long-term season preparation or the identity he had gone a long way to construct as a hockey player. After a truncated training camp and preseason that segued into one goal, two points and a minus-four rating through his first 18 games, he picked up his production in late November before giving way to struggles through much of the winter. When Muzzin was off, the bottom seemed to fall out, even if he wasn’t as responsible for the team’s coverage breakdowns as some might think. Though he had been a minus-three only three times through his first 317 career games, he was a minus-four three times over an eight-week span between the middle of December and early February. That raised the “So – what’s up with Martinez and Muzzin pairing?” discussion that had been lingering near the surface for parts of the season. As Sutter noted in December, Muzzin was still being challenged in the “angle-stick” part of the game, where defenseman use angles and their stick to create separation without the use of heavier body checks. “I mean, you’re trying to get Muzz to be more of that type of player, so consistently where Drew does it, most of the time where you’re trying to get Forbort and Gravel to not get off their angles and make sure that they’re making contact and they have a strong stick,” Sutter said. “It’s not necessarily ‘making contact,’ but it’s in that part of it.” There are so many ridges, rifts and niches in Muzzin’s skill set, which is broad and incredibly diverse yet still jagged in many areas as he continues to sand it out. One way to smooth away the rougher edges is through his experience, which he has as a Cup winner, as well as his likability and leadership. He’s still trying to remain confident and not let isolated incidents affect his decision making and poise. “We get frustrated and down on ourselves,” he said in February, and that’s not really a good thing to hear from a Cup winner so late in the season. Though he’s among the league’s top play-drivers and posted possession rates superior to most of his teammates, his overall 5×5 CF% fell for the fourth consecutive year (there was nowhere to go but down after a 63.1% in 2012-13), as did his CF%Rel. 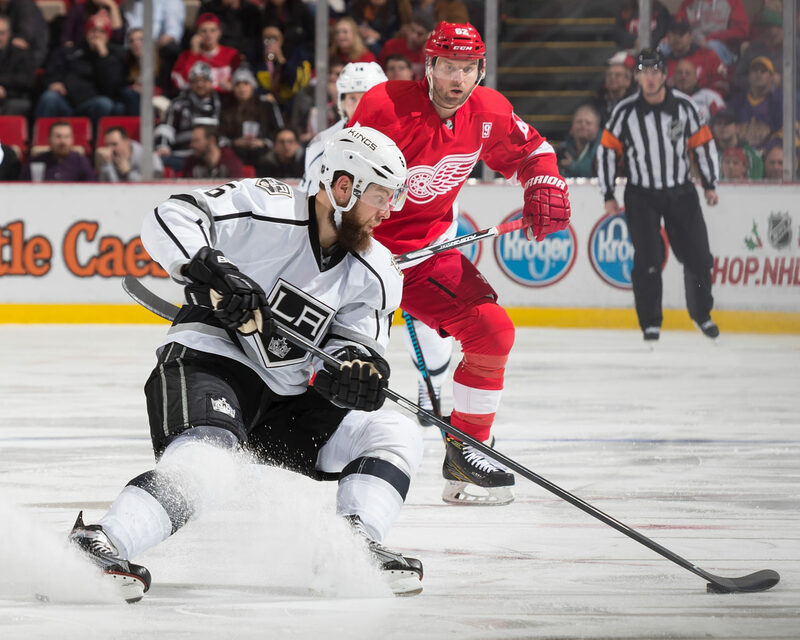 Going forward: Muzzin is 6-foot-3 and weighs 216 pounds. He skates well, he plays with firmness, he doesn’t often get overwhelmed by the heavier moments in the game and remains a reliable penalty killer. He has a blistering slapshot, a quick release on his accurate wristshot and is capable of withstanding over 20 minutes a night against quality competition on a good team, as he showed the year prior. The changes needed from Muzzin, who will begin his sixth full NHL season in the fall, align more toward the cerebral, which isn’t really something you can harvest and evaluate data from. Regardless, the Kings needed more from their “second” pairing – they averaged 3.36 GA/60 when Muzzin and Martinez were on the ice for over 768 (!) five-on-five minutes together – than what they received this past season. It’s still too early to be thinking about potential partnerships next year, but his partnership with Doughty (2.10 GF60 / 1.90 GA60 / 58.9 CF% over the last four seasons) has worked well in the past. 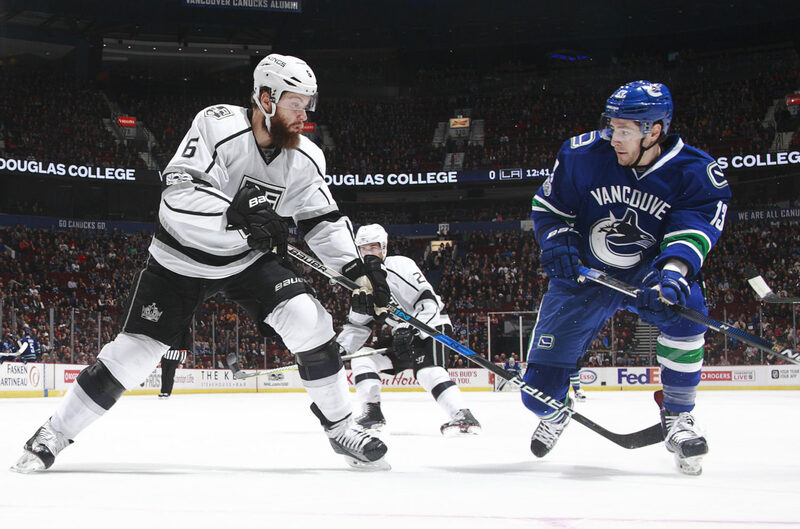 Because the Kings will be looking to add offense and have some defensive depth, and because Muzzin has term and carries trade value, don’t be surprised to hear his name come up in various rumormongering pieces this summer. But considering how hard the team worked to get him to sign in Los Angeles as a free agent after he wasn’t signed by Pittsburgh (or Nashville), any hypothetical movement at this point is speculative. It’s hard to get a read on where he’s headed because “improving inconsistency” is a nebulous endeavor, and the Kings will have a new head coach next season. 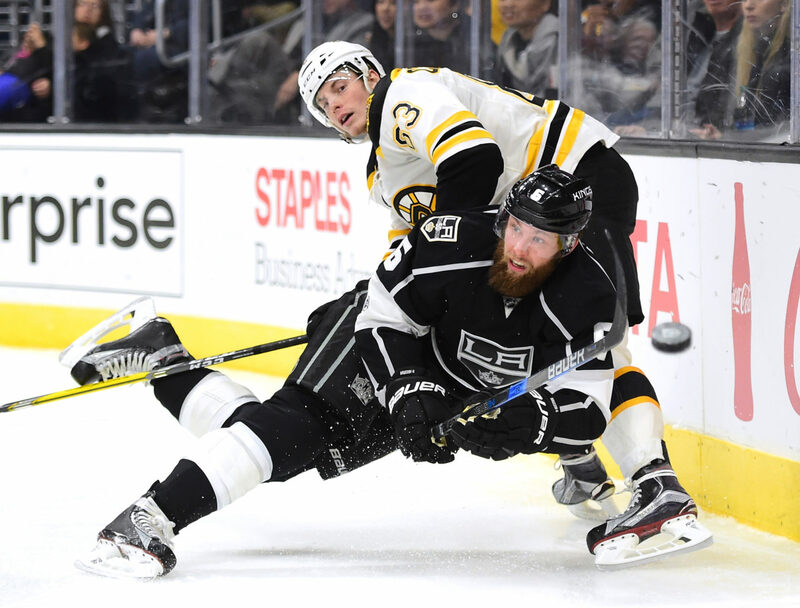 If that proverbial “slate” is “wiped clean,” as they say, Los Angeles still has a very good canvas with which to work despite some of the defenseman’s challenges. He carries a more than manageable cap hit of $4-million per year through 2019-20.